No wonder you forgot you were supposed to be looking after your friend's daughter. And she's not the first to go missing from your small town. In Paula Daly's page turning debut novel, set in the wonderful wintry Lake District, we encounter every parent's nightmare - a missing child. 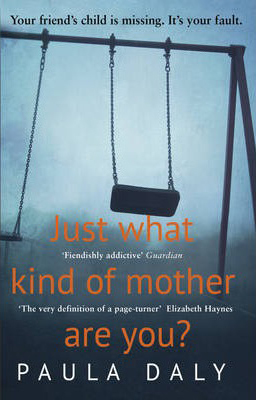 Where this novel stands out from the rest is the fact that Lucinda went missing when she was supposed to be in the care of her best friend's Mum, Lisa. I really felt Lisa's anguish pouring out of the page as she crushed herself under the weight of blame. I willed her on, together with her husband Joe, when she found the courage to face Kate and Guy. When suspicions turn towards Lucinda's Dad, Guy, I knew he had something to hide and, I have to admit, I did suspect what it was but I didn't get it 100% right and I certainly didn't see the other twists coming. I loved the inclusion of the scenes at Lisa's animal shelter and when she was out on a rescue visit; it was written with such feeling and was cleverly linked to the abduction story. These shelters do such amazing work and I thought it was brilliant that the author managed to raise awareness of the plight of such establishments whilst dealing with such a tense storyline. We are also introduced to DC Joanne Aspinall, her colleague DS Ron Quigley and her auntie Mad Jackie - characters who also make an appearance in Keep Your Friends Close. I do like to see some of the same characters in books as you feel like you get to know them. These characters inject a bit of humour into a serious storyline - there are some hilarious pages discussing alcohol consumption and Ron says he's not much of a boozer, he just has five or six pints on an evening! Paula Daly is certainly one to watch - her writing brings the characters to life and with more twists than a Curly Wurly, I can't put her books down and read this in one sitting (thanks to Tempur for providing the cushion).